and discovers she’s entered a world she never believed existed. After drinking a half glass of wine tainted with cyanide and spells her life is opened to the magick’s and evil that she denied. Hiding her magical abilities from herself for many years, she finds she has much to learn. Roman, one of the lake guards, has served longer than required. More than one hundred years ago he lost the woman he loved and stays with the Lake Guards longer than necessary. He’s told by the Oracle that Kris is an innocent who must be protected for the demon’s coming for her. When he first touches Kris, an electrical charge wakes him up and he’s he finds an attraction for the woman that means his life will change forever. Three demons, Abednego, Shadrach and Meshach, come after her, but unknown to them, they’re directed by a stronger, higher level demon called Garda. He’s a puppet master. With the help of three Lake Guardians and a witch, Kris takes her first steps into building her powers and facing the evil. Will Kris and Roman be able to merge together to fight the evil? 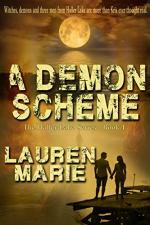 View more books in the genre "Demons".